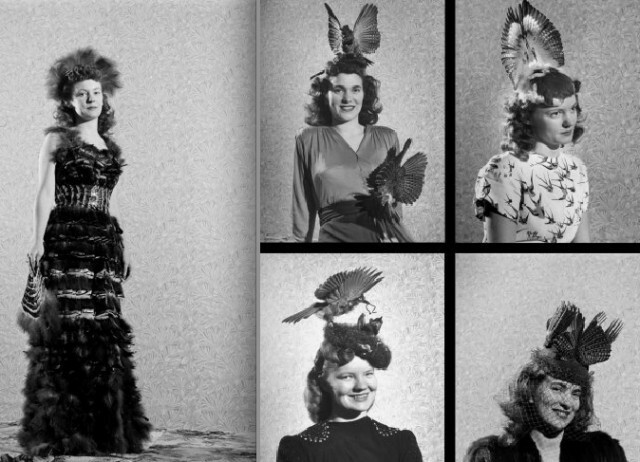 In 1948, a LIFE magazine writer was tasked with covering the wedding of "turkey enthusiast" Barbara Orr Ehrhart—a woman who made her wedding dress out of turkey feathers. And her bridesmaids dresses out of dyed turkey feathers ("the best thing is you can shorten it and wear it again!"). And had her wedding guests throw turkey feathers instead of rice. It just all sounds very unsanitary! All the feathers! Of course the turkey theme didn't end there—naturally, while draped in their epidermal growths, the bride and her wedding party sunk their teeth into turkey during the reception. The day after the wedding—which was held at the Far West Turkey Show in Turlock, California—Ehrhart filmed a short movie which featured her standing in a sea of turkeys. For some reason. And she told LIFE, and any of those criticizing the bird slaughter, that those 300 turkeys (300!) she plucked for her wedding were either already dead or wounded.